This grilled aubergine salad recipe can either accompany the main dishes or can be eaten as a light supper on its own. The recipe can be ready in just under 30 min. There only 199 calories and 8g of net carbs per serving. The salad can be served cold or warm. You can refrigerate the salad for up to 4 days, sprinkling some cheese just before serving. Recipe Nutrition Profile: Diabetes Appropriate, High Calcium, High Fiber, High Protein, Low Calories, Low Carbs, Low Cholesterol, Low GI, Gluten Free, Vegetarian, Good Source of Phosphorus. Make the dressing by binding all of the ingredients together and set aside. 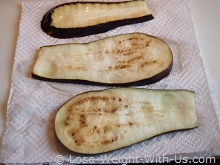 First of all, we need to prepare the aubergine for cooking. 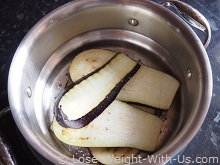 Place the aubergine slices into a colander and sprinkle generously with salt. Leave them there for 20 minutes to drain the bitter aubergine juices. Then place each slice on the tray covered with kitchen paper and pat the slices with kitchen paper from both sides trying to get the salty water off. Brush the slices with olive oil. Cook on the grill, griddle pan or barbecue for 3 min on each side till they are golden. Arrange the slices on the plate. Drizzle the dressing over the aubergine slices. 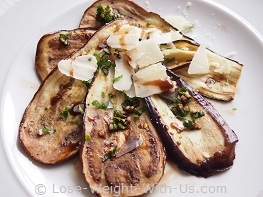 Use a vegetable peeler to shave the parmesan cheese over the aubergine slices. Serve seasoned with pepper.